More than a century ago, the premiere arts magazine being published was International Studio. It was the progenitor of Collier’s and Town & Country, and it was as much a society mag (photos of Monet – in his garden!) as anything else. But then something called World War Two happened, and this beautiful, oversized, lush magazine all but faded into near-obscurity. In the late 1990′s, I took over the trademark, and announced a revival of IS as the Art Magazine for people who actually loved art and illustration. I really wasn’t enjoying the current crop of art magazines where the focus was on the text, and the art was relegated to postage-stamp-sized reproductions. So I wanted to produce a periodical that actually celebrated and showcased the art. 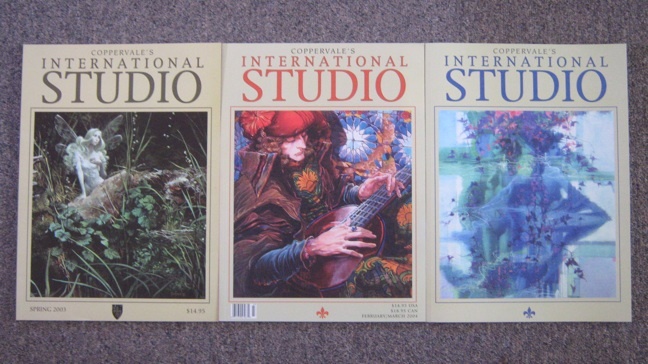 Only one issue (featuring children’s book illustrator David Christiana) was published in 1998, and is long unavailable – but the Coppervale Studio did manage to produce three editions of International Studio in the last decade before the unique purgatory that is Magazine Publishing & Distribution made continuing completely unfeasible. The three issues run between 48 and 64 pages, are oversized, squarebound, on lush, heavy stock, and featured extensive pieces on some of the greatest illustrators of today and of yesteryear. Edited and designed by James A. Owen, the cover features are on James Christensen, Barry Windsor-Smith, and the great Bob Peak. Much of the material printed was from personal archives, and includes many full-page pieces suitable for framing. These were accentuated with features on William Stout, the lost murals of Willy Pogany, the work of Scott McOwen, Sleeping Beauty designer Eyvind Earle, Tony Harris, Ogden Pleissner, and more. The first two were priced at $14.95 each, and the Peak issue at $20, but we’re now offering the set of all three magazines to you for $28, postpaid. If you love the work of these artists, or beautiful illustration work in general – especially Windsor-Smith and Christensen, as influences on my own work – these are not to be missed! Click on the link below to place your order.